Goji berries date back to ancient Chinese medicine, are considered both a fruit and a herb. They’re found mostly in Asian and European countries but are shipped to North America because they’re very popular right now. Goji berries are known by several different names. Often called wolfberries or Tibetan berries, they have a naturally sweet taste, and can add a bit of texture in your beverages, thanks to their fibrous, tiny seeds. 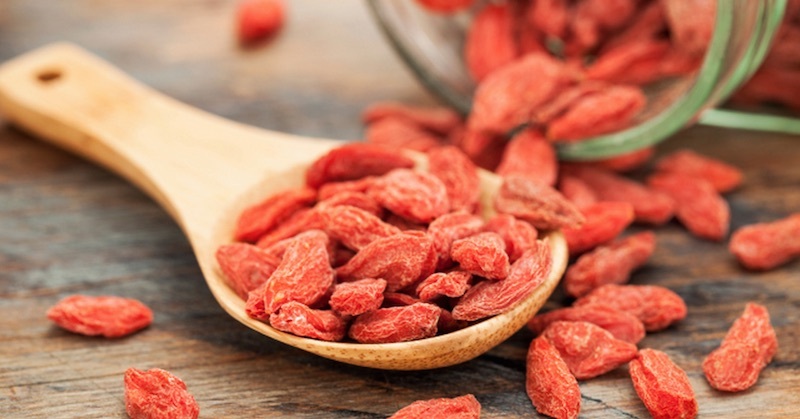 Goji berries, like most berries, have beta-carotene which promotes healthy, glowing skin. These berries help protect and enhance the immune system and reduce tough cold symptoms because of the high amount of vitamin C.
One of the very few superfoods that have a wide range of trace minerals, they are rich in zinc, calcium, germanium, selenium and phosphorus. With more iron than spinach, all 18 amino acids, vitamins A, C, E and the B vitamins, they might be even more nutrient dense than most other berries. Goji berries have a very high oxygen radical absorbance capacity (ORAC)—the USDA test, used to determine the antioxidant level of foods. You need only 20 grams to reach your daily recommended level of antioxidants. Low in calories (144 per half-cup), packed with fiber (8 grams per half-cup) and zero fat makes goji a go-to for healthy berries. Goji berries have been used as a natural medicine for thousands of years, to help with diabetes, hypertension, and other inflammatory problems, like fever and lower back pain. These little red berries are often sold in their dried form. Select high quality, organic berries when purchasing them from your local organic stores. Snack: Eat them as they are, dried or raw, for snacks. Smoothies: Soak a handful of goji berries in pure filtered water for about 10 minutes or until they are plump and juicy. Add them to your daily smoothies. Trail mix: You can make your own trail mix by mixing your favorite nuts and dried fruit and add some goji berries. Tea: Add a handful of goji berries to a cup of hot water (or in your herbal tea). Let it sit for about 5 to 10 minutes till they become plumped. Oatmeal: Add some goji berries to your oats as you would raisins or dried cranberries. Soup: Add a handful in your soup. 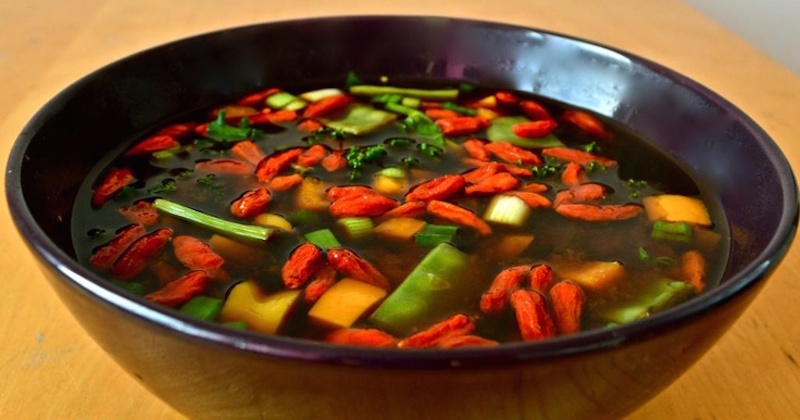 This is the most common use of goji berries in Chinese cuisine. Salad: Sprinkle them in your salad. Goji berries may be an allergenic to some people. If you are prone to allergies, try a few berries to start. If you are on any medications, especially blood thinner such as warfarin, aspirin or other similar medications, do not consume goji berries.